One more marshmallow frosting recipe - this time I'm using the frosting as a filling for the cupcakes though. These are homemade versions of the ever-popular Hostess cupcakes - complete with little swirls scrolling across the tops. A couple tips for these - make your ganache in a small container that is at least a few inches deep so you have enough depth to dip your cupcakes even as you get low on ganache. Also, you'll want to make sure you fill your cupcakes full enough that they rise over the tops of the liner so you aren't hitting the liner before you hit the cupcake when you dip them. 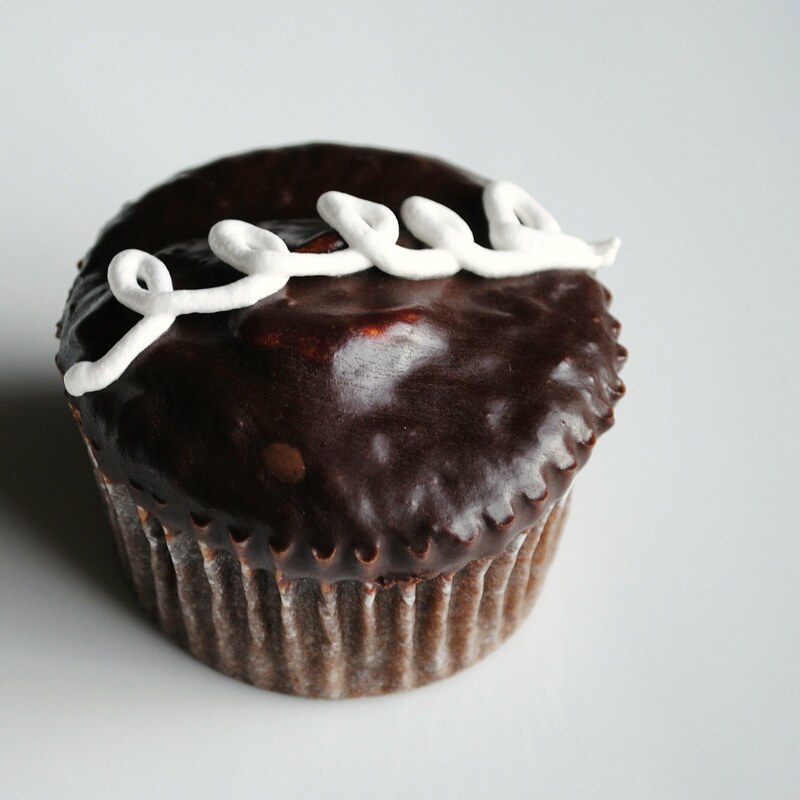 You'll have to work quickly once your ganache is ready as it cools quickly and gets thicker as it cools so its harder to make the tops of the cupcakes smooth. To fill these cupcakes, I used the cone method. Once cool, I cut out a small cone-shape in the center of each cupcake with a paring knife and then filled them with a piping bag full of marshmallow filling. This allows much more filling in the center than if you just try to pipe the filling in. Once the ganache is set, you can add any decoration you want, I used a bit of extra marshmallow filling and changed my piping bag to a small round tip (I think I used Wilton #3) to pipe on the traditional swirls. Preheat oven to 350 degrees and line pans with cupcake liners. Recipe yields about 30 cupcakes. Combine sugar through salt in a large boil. Add eggs, milk, oil and vanilla and beat on low until just incorporated. Increase speed to medium and beat two minutes. Stir in boiling water, the batter will be thin. Transfer batter to prepared pans, filling each liner about 3/4 of the way full, approximately 1/4 cup of batter. Bake approximately 22 minutes, until a toothpick inserted in the center comes out clean. Cool in pans about five minutes and transfer to a wire rack to cool completely. 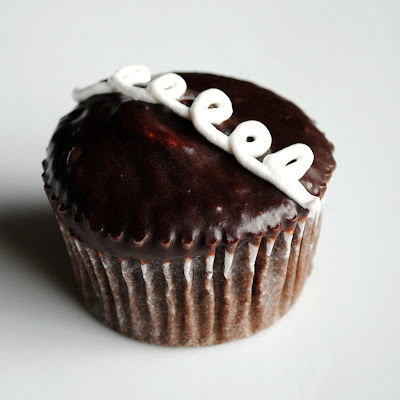 When cool, use a paring knife to cut a small cone shape out of the center of each cupcake. In a double boiler (I set my stainless steel mixing bowl over a small saucepan) combine egg whites, sugar and cream of tartar and heat over simmering water. Whisk almost constantly, heating to 160 degrees. Transfer mix to mixing bowl and beat on high speed (with whisk attachment if you are using a stand mixer) until egg whites hold stiff peaks. Add vanilla and mix until just incorporated. 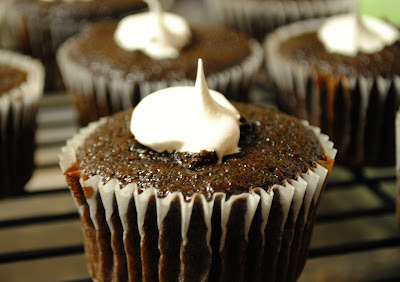 Transfer to a piping bag and pipe into the holes in the top of each cupcake. Reserve remaining filling for piping swirls or decoration as desired. Heat heavy cream until simmering in a small saucepan (you can also microwave but do it in 30 second intervals and watch it closely). Cut chocolate into chunks and put in a small bowl. Pour cream over chocolate and let sit for one minute. Stir until chocolate is melted. Let stand about 5 minutes and then dip each filled cupcake quickly into the chocolate, tap lightly to get rid of the excess and turn over. Let cool on a wire rack until chocolate is set. Pipe on swirls or decoration as desired. Yours look great! Aren't these cupcakes awesome. We love them.